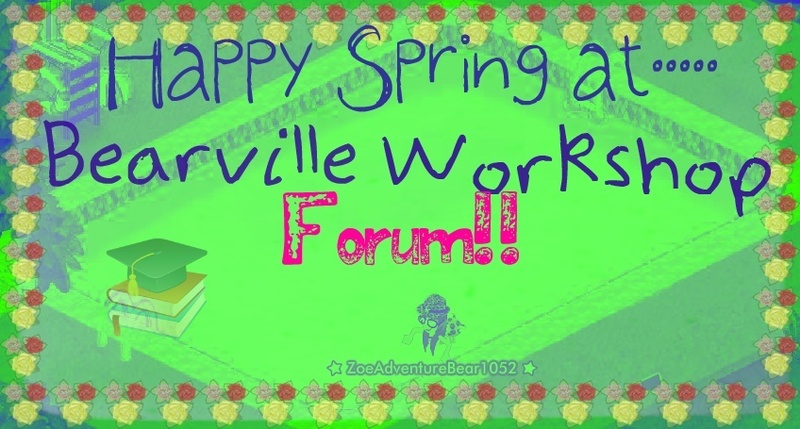 Welcome to The Bearville Workshop Forum! Have fun here at BWF! PM Zoe if you have a problem! Make sure to refer people to the site and you can win a prize! Looking for another Admin and two moderators, apply in Job Fair!! BWF has been 'revamped'. Enjoy the new look! Zoe is your Lead Administrator. What's going on in Bearville? BRAND NEW FEATURE! A NEW WAY TO CONNECT! Jump to: Select a forum||--Admin's Corner| |--Fourm Rules!| |--Notes and Updates| |--General Discussion| |--Portal Newz| |--Job Fair| |--The Workshop Contestz| |--Member Contests| |--Newbiez Section| |--Introduce You! :D| |--Help!| |--Guides to Babv!| |--Things about Bearville Workshop that you should know!| |--Bear Bucks Galore!| |--Flea Market| |--Auction House| |--Member and Staff Auctions| |--Suggestions :]| |--BWF suggestions| |--Ideas Sent To Maxine| |--Suggest Songs| |--What's going on in Bearville?| |--Special Guest Radar| |--Codes| |--Did you hear...?| |--Laugh Out Loud Glitches| |--Quests and Challenges| |--Furry Friends Rock!| |--Monthly Buildabear| |--Camp Happy Heart!| |--Help yourself to...| |--Avatar and Siggie shops| |--Bearywood Creations| |--Build-a-Bear Addicts| |--Super Screenshots| |--Party All Nite!| | |--Our Official Random Dance Parties| | | |--Cub Condoz| |--Social Snailz| |--Book Club| |--Role Play| |--Links!| |--Team Play| |--Pollz| |--Motor Mouth| |--Clubz| |--Bear of the Month!| |--Excellent Extraz| |--Trading Cornerz| |--Badgez| |--Badge Rulez| |--Artist Badge| |--Born Writer| |--Club Lvr Badge| |--Good Sportsmanship Badge| |--Help a Newbie Badge| |--Nice Bear Badge| |--Pawsome Guide Badge| |--Pawty Host Badge| |--Refer Members Badge| |--Rule Follower Badge| |--Bear Bucks Store| |--Collect your stuff| |--Corners for you, members! |--Staff Corners |--Mousie's Awesome Corner!